The Red Accordion Diaries: A genius device that my favorite British grocery added to their carts. A genius device that my favorite British grocery added to their carts. I love my iPhone. It's magical in so many ways. But one thing I prefer to write down by hand is my grocery list. Sure, it's nice to be able to keep a note that you always have with you for those times when you make an unexpected trip to the store and don't have a little notebook with you. Still, I really like a handwritten grocery list. 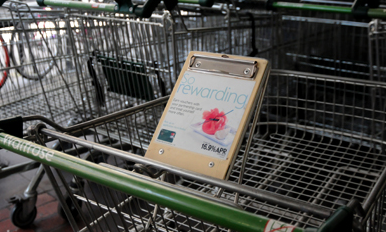 In today's short blog, I bring you the genius thing our local grocery store did, in hopes that our Kroger could, perhaps, not only improve the store layout, but also our shopping carts: put small built-in clipboards to the front of your shopping carts. I'm sure I took a photo of a Waitrose shopping trolley while I lived in Edinburgh, but I can't find it right now amongst the thousands of photos I've got. A google image search for Waitrose shopping carts shows Princess Kate, so I thought I'd just use this image to point out what I'm talking about. Ignore her perfect blow-out and adorable ballet flats, and instead focus on the clipboard that is so conveniently and permanently attached to the front of the cart! So simple, and yet so comforting. I know, I know, I should just ask Siri if I've gotten everything I need at the store. I swear I am a huge lover of technology. But I really love crossing things off a list, and who doesn't love a good clipboard? No wonder Europeans are so skinny. Look how small their carts are! How can you fit a 10 for $10 set of 2-liter sodas in that thing? ?